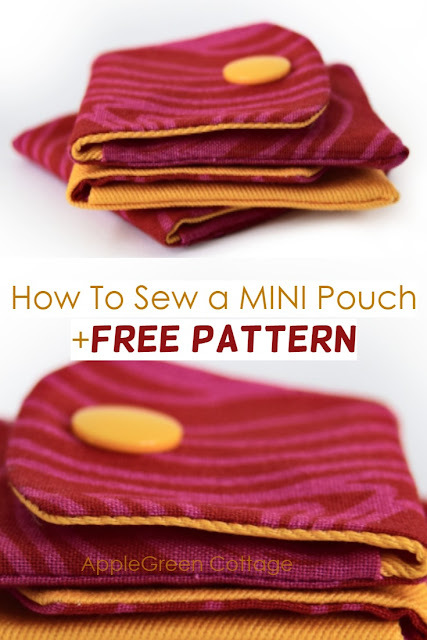 Mini pouch with free pattern - This is an easy tutorial that also gives you a free PDF template to sew. 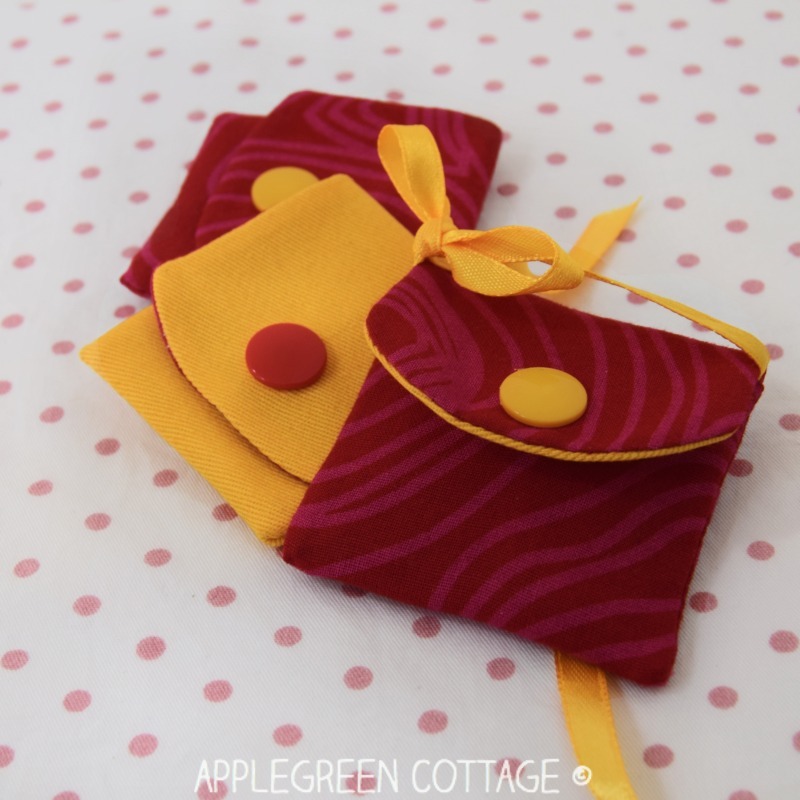 For when you need something really small, a cute little pocket which can be added to your key or become a doll-sized handbag, or you can use it as a holder for tiny gifts, like I did this time. 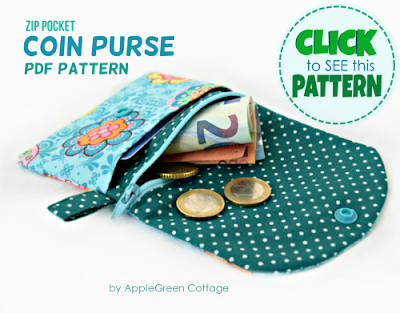 Together with this (larger) popular coin purse, this mini version would be a great addition to an Etsy shop! 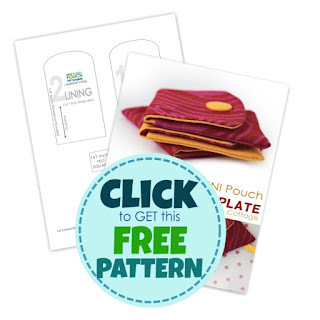 Scroll down to get your free PDF pattern! 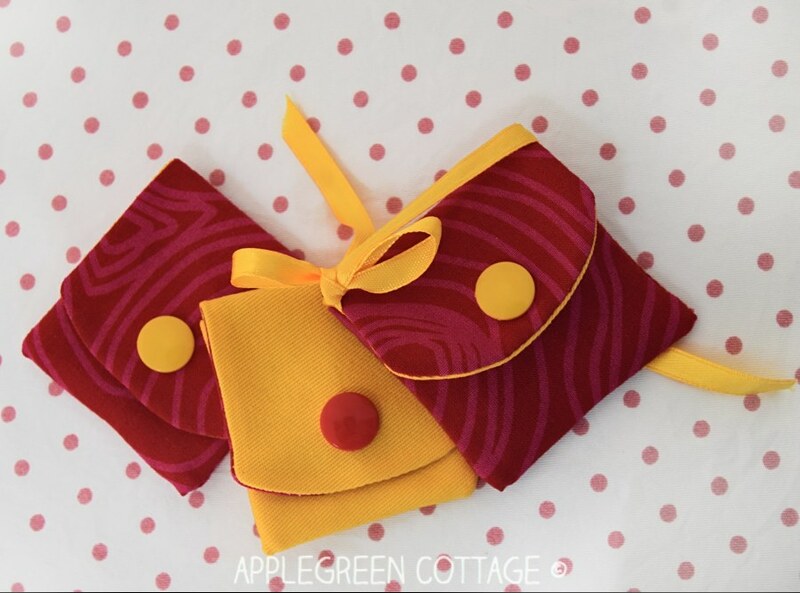 What you get here is a free sewing pattern for an easy sewing project with scraps, a tiny fabric pouch that can be used as DIY gift wrap, as doll bag pattern, or you can use it on your keychain if you stitch a tiny ribbon onto it. 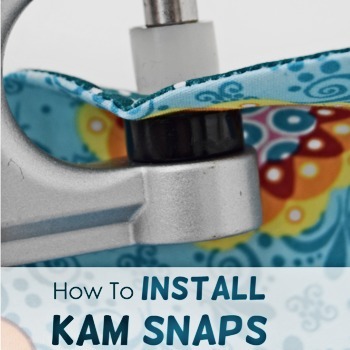 It only requires scrap fabric. One of my favorite projects! All you need are tiny scrap pieces of cotton, no interfacing. 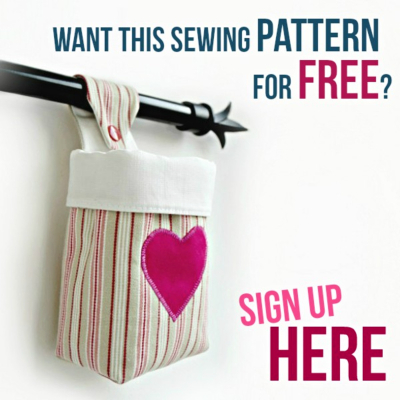 Add half an hour of time and a sewing enthusiast - you! You know me, I love tiny sewing projects. So when I say it IS a mini project, it REALLY means miniature. 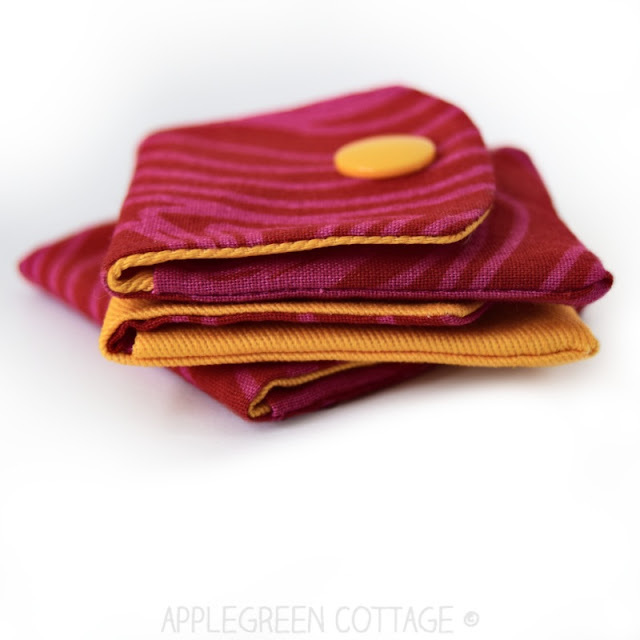 We're talking 2 inch pouches here. Really! Finished size is 2 inch by 2 inch (5cm x 5cm). A cute miniature pouch, just like I said! 1) Start by pressing your pieces and making a narrow, 1/4 inch or less, fold back towards the wrong side of fabric on the lower end of the pieces. 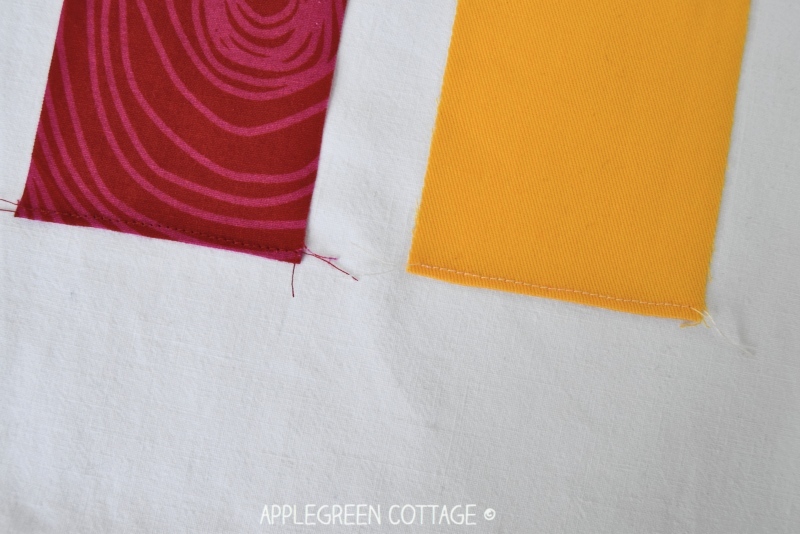 2) Topstitch along the fold. 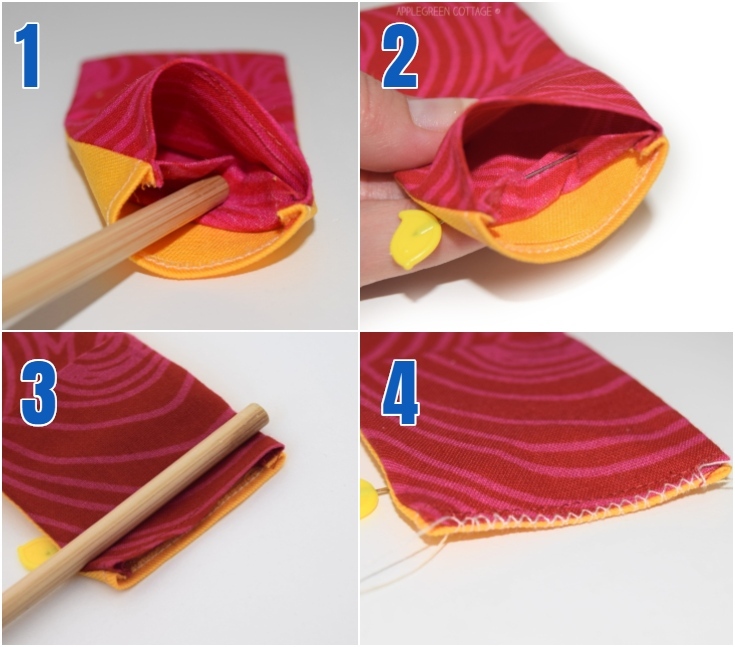 3) Mark FOLDING LINES: The main (longer) piece - starting at the stitched bottom, mark three lines, each at a 2-inch (5cm) distance from the previous one. See the images above. 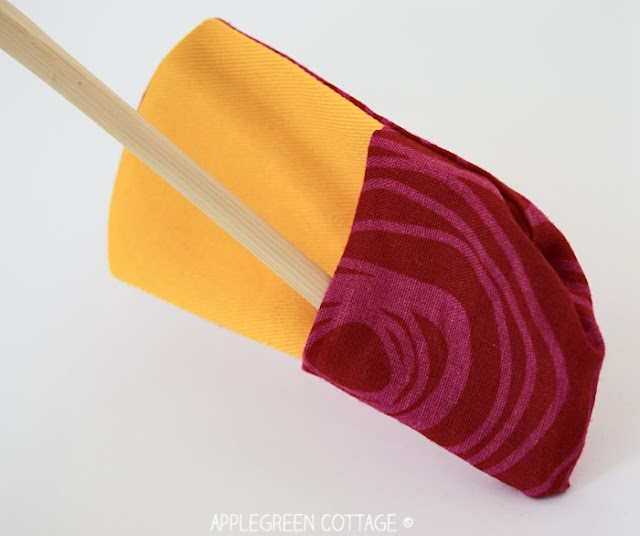 4) Folding the main piece: place the piece right-side-up on a flat surface. Fold it as marked in the image above. 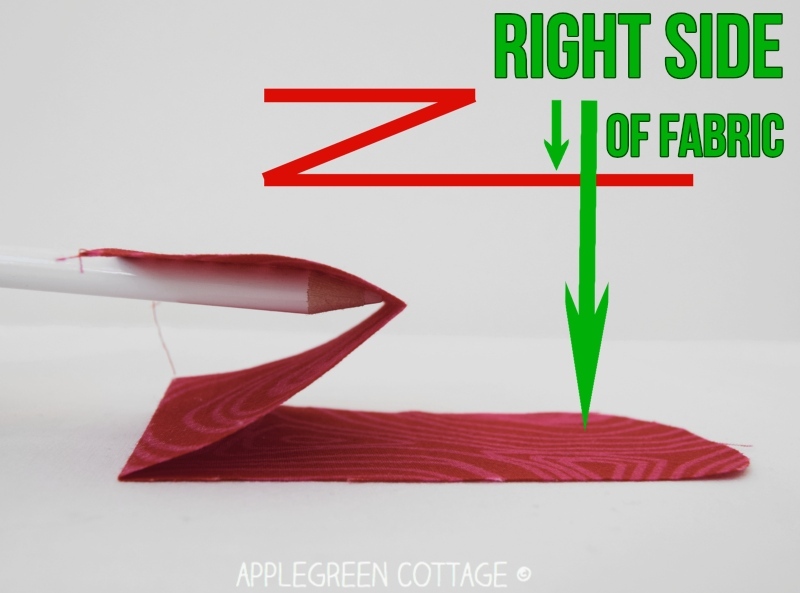 When folded, the longer piece will become exactly as long as the lining piece. 5) With the main folded piece still laying flat, right-side-up, place the lining piece onto it, so that the right sides will be together (RST). Pin or use Wonder clips to prevent shifting. 6) Stitch around, leaving the bottom out. 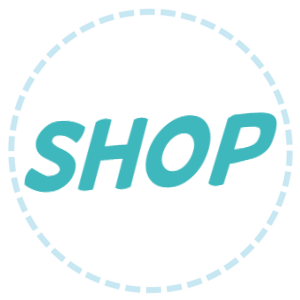 This means you start at the bottom (where the ends are already finished), go all the way to the rounded top, and back down to the bottom. Do NOT stitch over the bottom side. 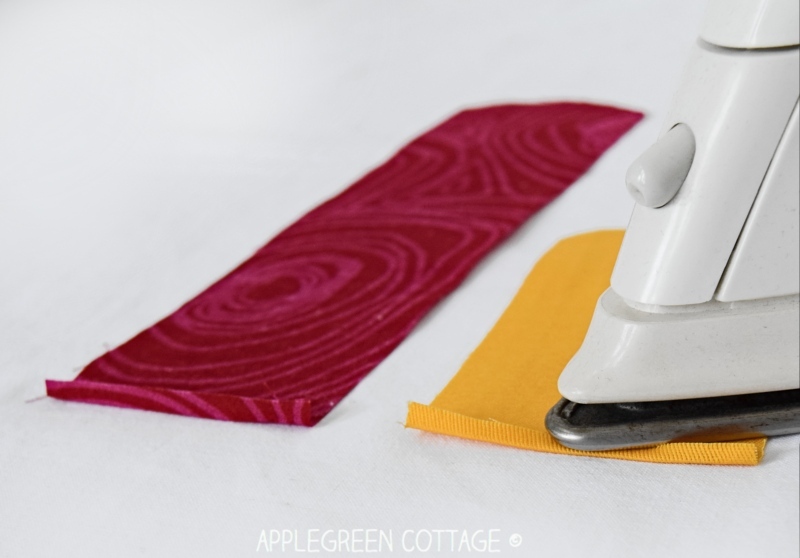 Trim the corners for a nice finish and to reduce bulk - take care not to snip into any stitches. 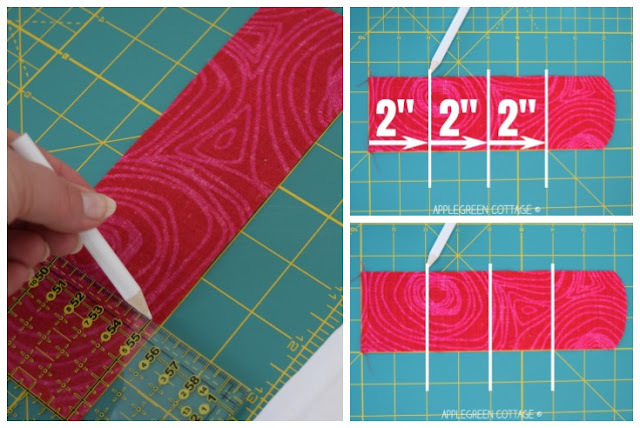 You can use pinking shears to clip the curved edge portion. 7) Turn right side out. I often use a chopstick to make it easier. - see the image marked with No 1 on it? Push the middle layer towards the top, so it won't be in the way. Then attach a pin to keep it away from the needle. 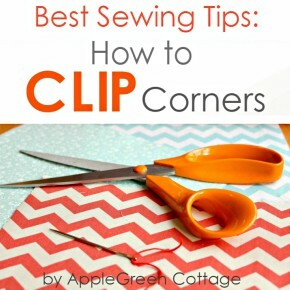 Only then, use a zigzag stitch, or a simple slipstitch to close the opening. 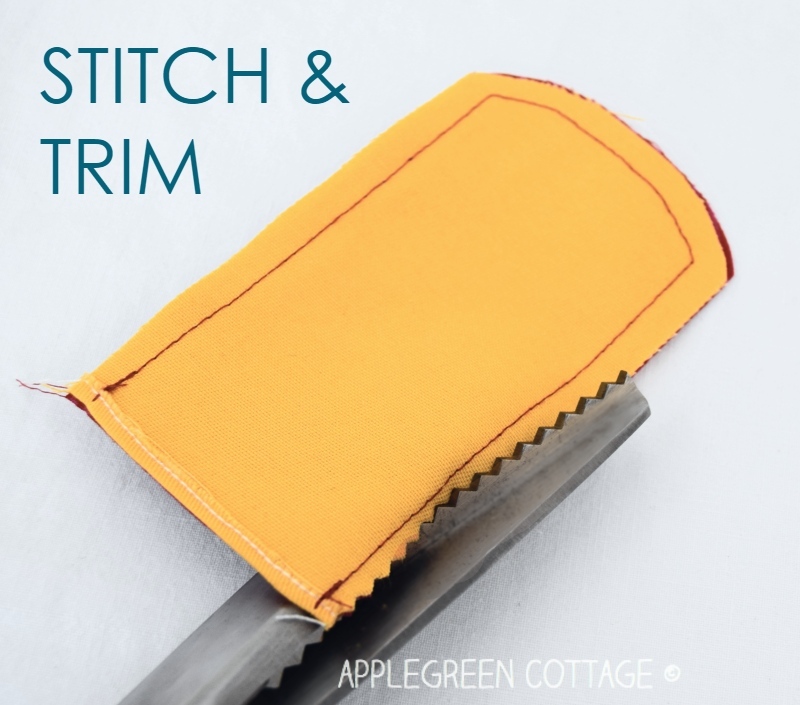 You only stitch through the two topstitched ends, not through the middle (folded) one. 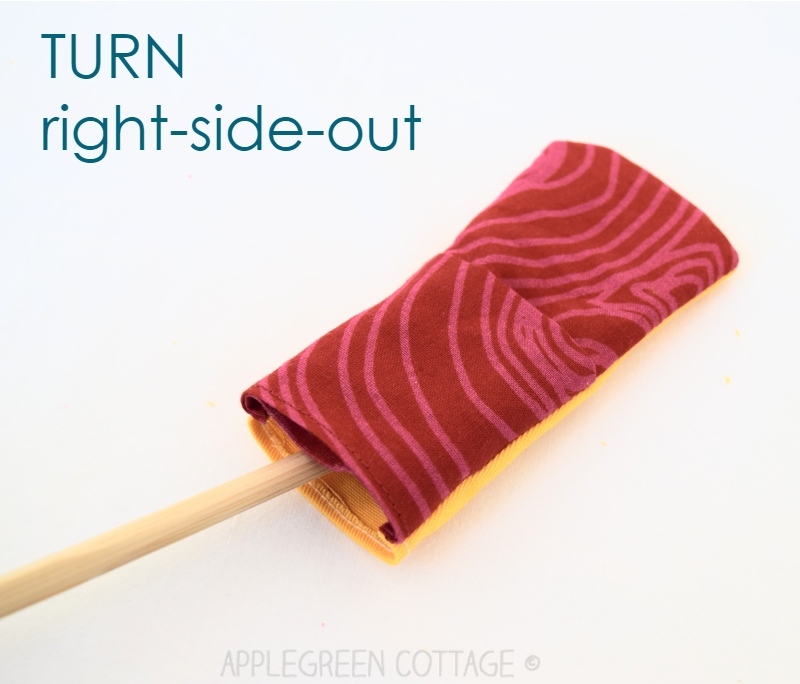 MAKE IT EASIER: you can skip this step if you don't plan to use the mini pouch for something really tiny - like a tooth fairy pouch. Also, you'll notice the opening will be inside the zipper pocket, making it invisible from the outside, anyway. 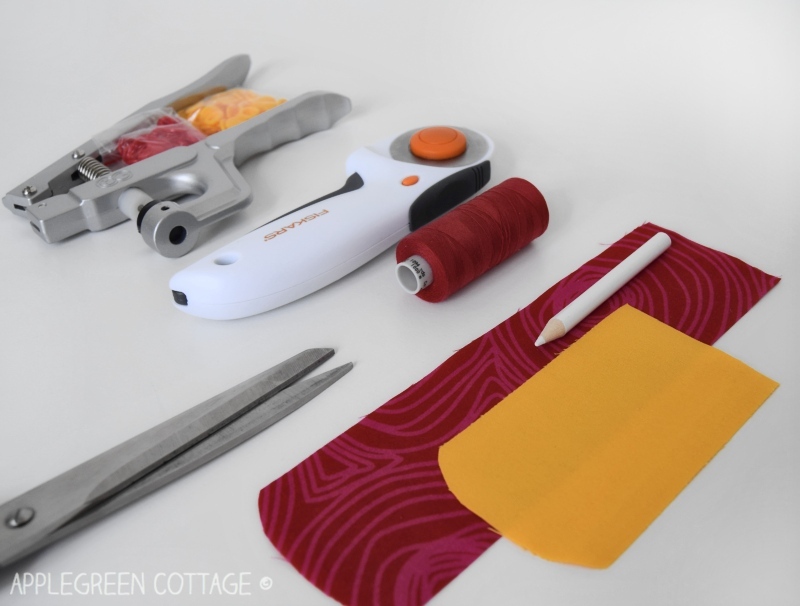 9) Now, turn the pocket part inside-out. Press. I used two of them as a gift wrap for little gifts to my two nieces. The third one, well that one is waiting to be used for something completely else. I'll tell you more about it some other time. Get the free pattern here in my shop. Yep, for free! 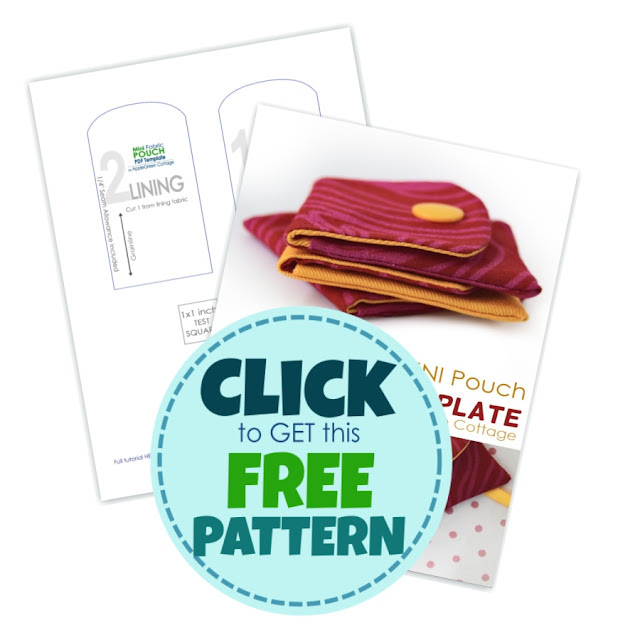 Now all you need to do is grab your free template and sew a few mini pouches! 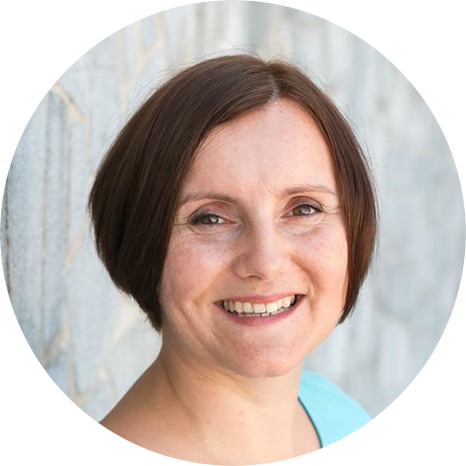 Oh, Damjana, your little pouches are SO cute!!! I agree, they'd be great as gift wrapping. Thank you for the new pattern! Cute little pouch, and great tutorial, I will make one (or several;) )! Thank you so much for your adorable pattern. That is such a clever way of putting it together, I think I've tried to work it out myself before and got in a right old pickle! Pinning. My granddaughter thought these would make excellent backpacks for her dolls. Added some elastics and made several. Eeep, what an excellent idea, a mini backpack - I'd love to see these!